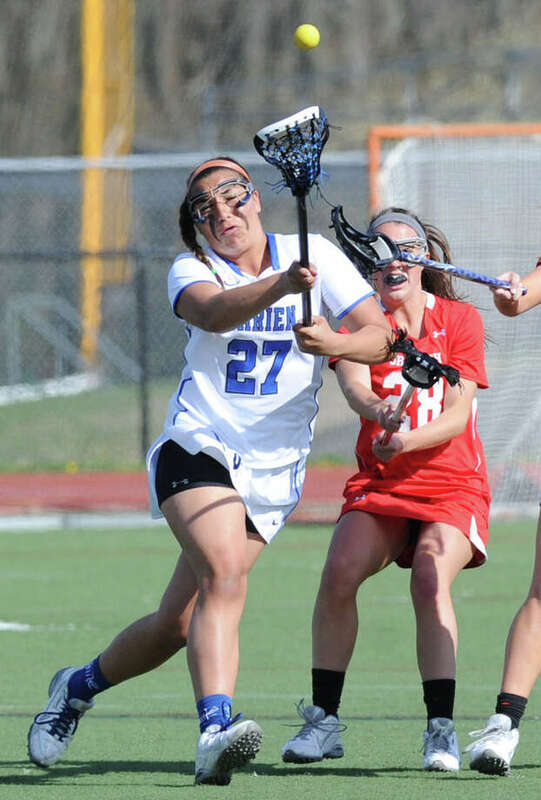 Darien entered Thursday's girls lacrosse showdown against Greenwich High School averaging a sparkling 17 goals per game against its previous four opponents, yet Blue Wave coach Lisa Lindley was still searching for her squad's offense to fully click. Unfortunately for the Cardinals, Thursday was the day when it did. The turnovers were few and the goals were plenty for three-time defending FCIAC champion Darien, which converted 20 of its 30 shots en route to rolling to a 20-10 victory over visiting Greenwich in a key midseason conference game. Junior midfielder Katie Cronin scored a team-high five goals while seniors Mariah Matheis and Anna Moorhead each tallied four times to power the Blue Wave (7-2, 6-0 FCIAC). "Today was the first day I thought our offense showed their true ability," said Lindley, whose Blue Wave has also captured the Class L title the past two seasons. "It was nice to see, I always thought they had it in them." Embarking on a 7-0 run, Darien went into halftime with a comfortable 13-5 lead. "The offense really clicked today," Lindley said. "Our perimeter shooting is something we drill a lot, so it was a matter of some of our players getting more confident in the ability to shoot. I'm very pleased with our offensive play today." The Cardinals, who lost to the Blue Wave twice last season, received four goals apiece from seniors Anne Dunster and Maddy Graves. Greenwich (5-3, 4-1 FCIAC) kept pace with Darien the first 14 minutes of the opening half, then the Blue Wave went on their big spurt. "This game was a big learning experience for our team," GHS coach Caitlin Young said. "We need to find that level of competitiveness and compete on a daily basis. We practice hard in practice, but we need to put those things in action during games." Cronin started the scoring, tallying off a dodge 3:09 into the first half. Moorhead tallied off a pass from Gabby Noto and Moorhead put her free position attempt by GHS senior goalie Kylie Ginsberg, putting the home team on top, 3-0, with 19:37 to go in the opening half. Goals by Dunster off the draw cut Darien's lead to 3-2, but junior midfielder Chandler Kirby and Noto tallied in transition, making it 5-2 at the 16:40 mark. The Cards drew to within a goal twice in the first half on goals from sophomore Paige Mautner and Dunster. Then the Blue Wave got rolling. Matheis made a free position shot, then scored off a pass from behind the net from midfielder Laura Murphy, giving Darien an 8-5 edge. Cronin added two more goals in the first half for the Blue Wave, which held the possession advantage the majority of the game. "Today, we buried our shots," Matheis said. "We waited for the open cutters, kept our spacing, waited for open opportunities and made our shots." Matheis and Cronin scored twice in the second half and Kirby added her third goal of the day for the victors. Graves and Dunster each had two goals during the second half for the Cards. "Today's game definitely makes us realize that we need to learn how to fight and play the whole 50 minutes," Dunster said. "Once they started scoring, our confidence went down a little bit, so we can't have that drop-off going forward. Hopefully, we'll play them again this season." Said Young: "Some of their shots were falling and it's hard to swing the momentum in your favor when you can't get the ball on attack. I'm happy though that we finished the game strong." Sammy Nielsen, a senior, made four saves in goal for the Blue Wave, before senior Izzy Scribano (two saves) relieved her late in the second half. Ginsberg and Caroline Schultz combined to make six saves for the Cardinals. "This was our first big FCIAC game, so we wanted to make a statement to all of Connecticut and the tri-state area," Moorhead said. "We struggled a little bit in the beginning, but then we got into our groove. We are on the upswing right now and we are determined to keep on going." Scoring: G -- Maddy Graves 4 g; Anne Dunster 4 g; Paige Mautner 1 g; Maggie O'Gorman 1 g; Megan Collins 1 a; D -- Katie Cronin 5 g, 3 a; Mariah Matheis 4 g, 1 a; Anna Moorhead 4 g; Gabby Noto 2 g; Chandler Kirby 3 g; Laura Murphy 1 g, 1 a; Susie Ropp 1 g; Goalies: G -- Kylie Ginsberg (2 saves), Caroline Schulz (4 saves); D -- Sammy Nielsen (4 saves), Izzy Scribano (2 saves).